For thirty years an electronics and software engineer. Now of independent means. This is my adventure into sound hunting and field recording. Like Des Coulam of Soundlandscapes, the first time I came across audio recording as a child was with a hand-me-down reel-to-reel tape recorder. It seemed magical to me, but also tantalisingly impractical. This was in the 1970s. It seems not so long before then there had been an active community of ‘sound hunters’ – what we would now think of as field recordists. The world was quieter then – far fewer aircraft in the skies, less traffic. All good for what R Murray Schafer called ‘high fidelity soundscapes’1 – ones where the primary sound source isn’t buried in extraneous unrelated background sound. However, these sound hunters were severely limited by the equipment available at the time. Nowadays I can go to Amazon and pick up a small battery SD card audio recorder for about £80 new. Small, silent in operation, no moving parts. Cassette recorders made portable recorders cheaper and more practical, but it seems all the amateur field recordists had pretty much given up by the time these arrived. These portable recorders were generally used for recording music off records. As a young teenager I toted an EL3302 around various places – this was a good machine for impecunious field recordists because they hadn’t moved to the dreadful automatic level controls that marred many recorders in an attempt to make them easier to use. The tapes were still expensive. I wish I still had some of the field recordings I made as a child from London but the cost of tape and records meant that as a teenager I recorded over these field recordings with some now eminently forgettable pop music. Without transport I wasn’t that adventurous a recordist, but some of the recordings from my parents’ back garden when we still had sparrows and song thrushes in south-east London, and the recordings from Oxleas wood would have been nice to keep and perhaps compare over 40 years, and contribute to the fabulous London Sound Survey site. Sound recording hardware has become much cheaper, better and easier to use now. But the world has become much more polluted with man-made noise, particularly aircraft and traffic noise. Other sounds have often become more homogenous, too. Take something as simple as ambulance sirens and telephone bells – these used to be individual mechanical noisemakers, and no two sounded the same because of mechanical tolerances. Now they are more effective, cheaper, but less idiosyncratic in sound. The natural world is a great source of interesting sounds – there is still the wonder of birdsong to be found, along with the inspiring sound of natural phenomena life the sound of the sea. People and cities weave a rich tapestry of sounds, and it’s easier than ever to record these. What do I do with my Tape recorder? The title of Karin Bijsterveld‘s 2004 paper 2 sums up the problems of the early field recordists, and the manufacturers selling them mechanically noisy, mains-tethered machines. 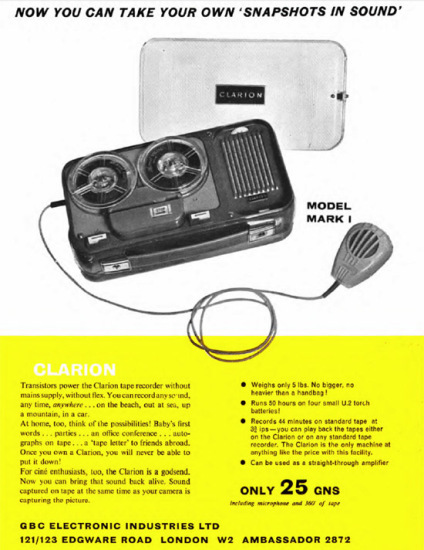 Reading back-issues of Tape Recorder from the excellent AmericanRadioHistory collection, it’s clear that the tape recorder was marketed to the public as a “sound camera” rather than a way to record/play music. It puzzled the manufacturers that this didn’t take off. I’m not sure why – the problem is clear in this photo of a field recording session at London’s Embankment in the Feb 1968 issue. Tape Recorder magazine was originally aimed at the amateur owner of a domestic tape recorder. 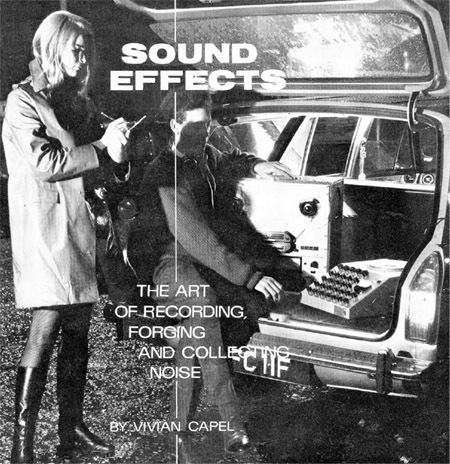 It changed direction to address a more professional readership when it changed to Studio Sound in 1970, but until then you could see some of the other problems faced by wannabe sound hunters – the machines were terribly unreliable, needing frequent repair and wow and flutter were never far away, which played hell with recordings of music. Not only did phonographers have heavy machines attached to the mains power supply, but these machines were mechanically noisy. To make the electronics cheaper manufacturers provided high-impedance crystal microphones, so the microphone cable was limited to a couple of metres before the cable capacitance slugged the high-frequency performance; our field recordist was therefore limited to a couple of meters away from a noisy tape recorder that was tethered to the mains. Exactly how the manufacturers expected their users to be that creative with these limitations puzzles me, it’s as if a camera came with a fixed wide-angle lens and a mains plug. That might be useful in a professional studio but is kind of limiting in the hands of amateur photographers. and soon after, for 20 years, recording devices didn’t come with a microphone, or even a microphone input, because people connected then to their record players and the radio to record music. It was only in the 1990s with minidisc and portable DAT that sound recording devices targeted at consumers had mic inputs.